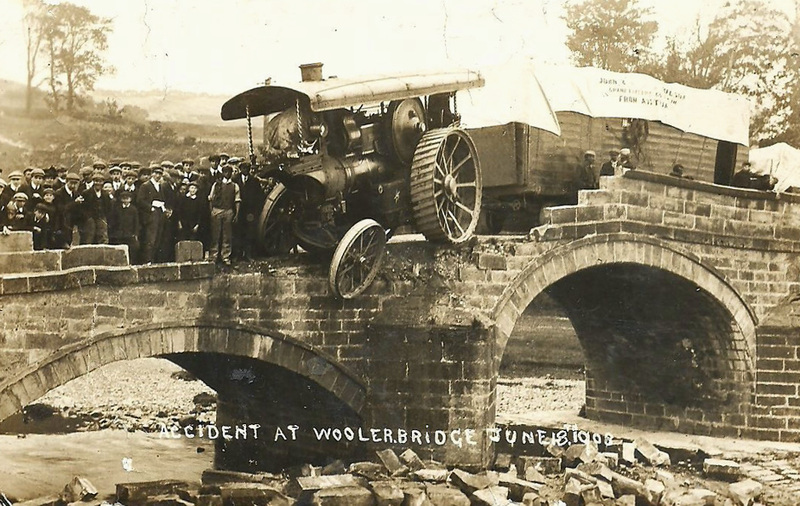 Photograph showing accident involving Wilson Bros Fowler 10328 "Dawn of the Century" and Switchback load on Wooler Bridge, Northumberland 18 June 1908. The engine is very precariously positioned, another 6 inches further forward and the whole train would have toppled over and ended up in the River Till with much more serious consequences. Fowler 10328 was a B6 class showmans engine built in 1905 for John & William Wilson who were a Scottish amusement caterer. The engine was later rebuilt and sold on to another Scottish showman, Henry Irvin, gaining the name "One of the Best". Whilst with Irvin the engine traveled with his Whale Scenic ride alongside an ex War Department Fowler 14114, "The Tiger". 10328 was one of very few Fowlers to carry an exciter dynamo on the offside belly tank. Later the engine travelled their Skid ride and was scrapped whilst in Henry Irvin's ownership. I have a follow-up regarding the ultimate fate of the Fowler company.In 1997 I handled the electrical installation of an electrode steam boiler at a sulphuric acid plant at Likasi in the Democratic Republic of the Congo (DRC). It was manufactured by Marshall Fowler of Randfontein, South Africa where I was resident at that time. The company informed me that they had bought up the original UK business and transferred it kit and caboodle to SA. I was presented with a company tie, which I still have. The boiler in the Congo was supposed to be replenished with treated water, but the users, Gecamines, tended to use raw river water when the dosing chemicals ran out. The boiler electrodes then arced and eroded, and wouldn't have lasted very long. There is something that this showman does and it allow us to work easily on dark side of higher education huffingtonpost. I know that a lot of people are not happy with it, but that's the thing. Quite historical update about the early engine that is pretty acknowledging to me. I love to gather such car related information and trust me that is pretty valuable to me. I also share on https://aussiessayservices.com/ozessay-com-au-review/ website such related information everyone can grab it on.